Specifics of a country's economics affect the issuing of stamps as much as any other form of government funds. The cover below is an example of the relationship between stamp issues and the economy of the issuing country. Because of the debt payments that were being made by Germany after World War II, the government inflated the Mark. The debate still goes on as to how much was caused by the reparation payments, and how much was caused by the German government of the time to avoid paying loans it may have been able to. 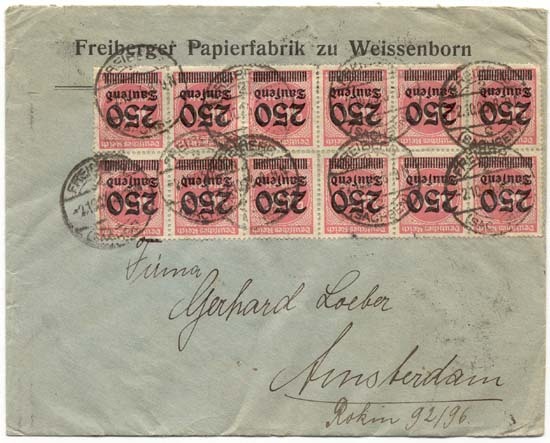 Either way, the postal rates between 1919 and late 1923 increased from being in the range of Marks to being in the range of German billions of Marks. German billions (1,000,000,000,000) are the equivalent of English/American trillions. The rate below is 6 million marks, and the cover is postmarked October 2, 1923. The front of the cover has 12 250,000 Marks stamps, and so does the back. During September to early December of 1923, inflation turned into hyperinflation, and postal rates changed in a matter of days.